The long-lived storm caused catastrophic damage when it hit Mozambique, Zimbabwe and Malawi earlier in March, leaving more than 800 people dead and hundreds more unaccounted for. More than two million people are in dire need of assistance, and the Mozambique ministry of and Food Security urgently requested support. CFAM Technologies, a South African enterprise and spin-off company of the North-West University (NWU) that specialises in food extrusion, offered to help alleviate the need for food supplies. “We immediately intervened and our partners, Botselo Holdings, was able to produce 10 000 x 1kg bags of porridge on CFAM extruders in less than a day,” says Prof LJ Grobler, founder of CFAM. The donation was facilitated by the ambassador of Food Security for Africa of the Pan African Parliament, Dr Brylyne Chitsunge. CFAM came into being in 2007, after more than 20 years of research at the NWU. Today more than 70% of all instant maize porridge products in Southern Africa are produced with CFAM’s extruders. “Through years of experience, research and network-building in Africa, we are privileged to be able to provide large quantities of food to the people who now needs it most,” says Prof Grobler. 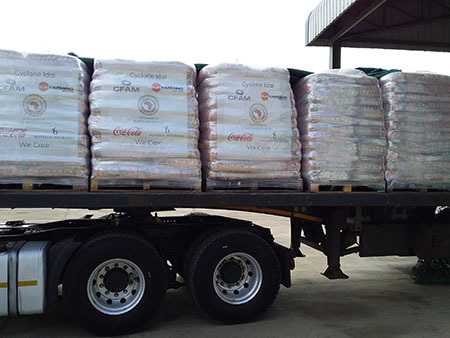 These bags of porridge produced by the NWU’s spin-off company CFAM Technologies are ready to be shipped to cyclone-stricken Mozambique.